Convert ShapeShift guiKit files to dlta files. Is there a better alternative to GuiKit2dlta? Is GuiKit2dlta really the best app in Desktop category? Will GuiKit2dlta work good on macOS 10.13.4? 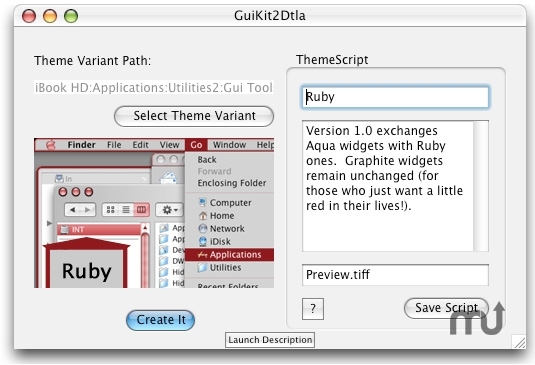 GuiKit2dlta is a simple REALbasic application that works together with GuiKitty (http://www.unsanity.org/archives/000314.php) to convert Shapeshifter's GuiKit files to working dlta files. It does this by extracting the Extras.rsrc, Finder.rsrc and Preview.tiff generated by GuiKitty and add's a small customizable themescript file to the mixture, then saves them all in one directory and renames-bundles it as a .dlta file. All this can be done by hand aswell, but hey! you're on a computer, things should be automated! Added editable version field so you can fill in your own system version. GuiKit2dlta needs a rating. Be the first to rate this app and get the discussion started!